CHECHESMITHNATION : South African Tv Host, Khanyi Mbau; Slayed At The Miss Heritage Global 2017!! 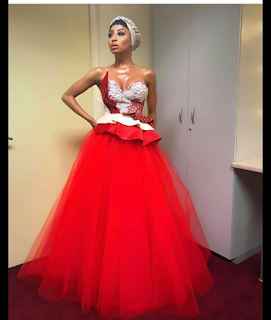 South African Tv Host, Khanyi Mbau; Slayed At The Miss Heritage Global 2017!! The actress and Tv personality, looked all radiant in three different frocks at the Miss Heritage Global 2017. Here she rocked an all black strappy ensemble. We are in love with her floor-length red tulle. She got dressed in the South African native attire teamed with black and yellow sneakers.